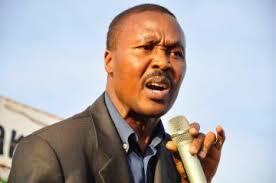 Gen Mugisha Muntu has condemned the arrest of opposition politicians. Courtesy photo. Gen Mugisha Mugisha, an FDC presidential candidate, has attacked his former boss President Museveni for continuing arresting his opponents and university students. Speaking at the press conference he held in Luweero district this morning, Muntu also asked Ugandans to rise up to defend their future. “The citizens should call and text their elected leaders in Parliament not to amend the Constitution,” he added. Muntu also attacked the Police for raiding offices of non-governmental organisations, arguing that the action was not justifiable. “It’s absurd that the same government which has been calling for debate on the age limit is now using excessive force to stop Ugandans from talking about it,” Muntu said. On Thursday, police and other security agents sealed off FDC headquarters, saying the party members were planning to stage demonstration in the city. Parliament on that was preparing to discuss on whether to amend Article 102(b) or not. This article bars Ugandans who have clocked 75 year and above to contest for the Presidency. Flanked by Ibrahim Semujju Nganda, the Kira Municipality legislator, Muntu also said power belongs to the people but not to government or military. 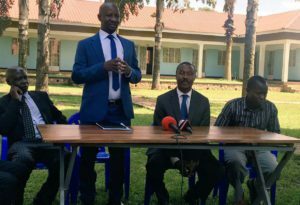 FDC spokesperson Ssemujju Ibrahim Nganda address journalists during the press conference in Luweero as FDC party president Gen Mugisha Muntu (2nd left) and other officials look on. Photo by Raymond Mayanja. “Gen Museveni and the police may close our offices but he cannot close our openness to change or people moving towards a post Museveni,” he stated. Over the weekend, all the priests were preaching about the Presidential age limit, with majority asking not to be lifted. Parliament will tomorrow resume its business, with both NRM legislators and the opposition preparing to a show down. This morning, KCCA opposition councillors held a meeting to discuss how to block the age limit motion.